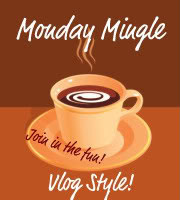 Monday Mingle Feb 1st 2010 - What movie character would you love to play? This week's questions were submitted by Amy from Mevolving...thanks Amy! 1. If you could be any literary / movie character who would it be and why? You will know that two of my favorite movie characters are Ralph Fiennes and Angela Bassett. Well they star in the same movie 'Strange Days' and so I would love to play Ms Bassett right here. There are other characters I would love to play, but I'm just narrowing down to the one that fit right in there for now. I really don't like germs and nasty places and it might be a phobia or used to be a phobia. It's all because of the orphanage which was always terribly nasty. 3. Do you have any pets? What are they and what are their names? I don't have any pets. I used to want a dog really bad, but now I'm not sure I want the American way responsibility of petting. I am also thinking of a kitten. They seem to care for themselves better. I'm still a dog person though. Maybe the kids will choose. The husband is pro cat and I'm pro dog so you understand how this decision process is turning out. In my country, animals are not pets, so it's a learning process to watch animals being treated better than people. 1. Would Super Nanny say if she came to your house? And a heartfelt thank you to Marie aka Dolly at http://thenewxmasdolly.blogspot.com who shared this award with me. You are a sweetheart and so glad to be getting to know you! Thank you for visiting with me and have a great week! Oh, I've never seen that movie "Strange Days." I'm totally going to add it to my netflix though. It looks so good! I'm also a germaphobe. Probably not as extreme as some. But it certainly freaks me out. Those germs everywhere! I've not seen that movie either. And here I was thinking I was well versed in movie watching! Germs don't bother me so much. It's how we build up a resistance to them. I realize the call for hand sanitizer everywhere at the moment with so many wide-spread illnesses but if we keep using things to keep us germ free, we risk putting ourselves into a bubble and then really run the risk of contracting everything if we're in the wrong environment. Like a doctor's office waiting room! Yuck! Never seen the movie Strange Days. Dontcha ya just love Monday mingles? Hope you have a great week darlin'! LOL.. Ok so when I read germs I instantly thought of that commercial that had a woman opening doors with her feet so she and her kids wouldn't have to touch it.. I have to say that I also have never heard of Strange days.. I'm going to have to check it out and I can totally see you as Angel Basset! Thanks again for your help on Twitter last week! I'm pro-dog but they sure are a lot of responsibility! Lovely seeing you again as always hon! Oh yeah, germs a big one for me too. I don't like crowds or escalators either. LOL I have issues I guess. Your quite welcome, but there's really no thank you involved. You more than deserve it because your post is awesome. 1st time I stopped was because of your picture on the blog. It's awesome! It reminds me of that movie Casablanca. I don't know why it just does. hehe Plus, you're so nice & friendly & an interesting person. Kudos on your blog. BIG HUG from Illinois! Today I stopped because of your ? too! Who would I like to play in a movie? Ingrid Bergman in Casablanca who else! It's only one of many I'd love to do. Have a great day my friend! I am SUCH a germ freak... but I work really hard to try to not think about it. Especially now that I have kids and I don't want to pass my insanity on to them. I remember strange days! And Angela Bassett is incredible. She exudes confidence and power, with out even trying. Great choice. I had a similar fight in my house with the pets - my husband was on the dog side, though. He won! I think we would have been better off with another cat - they are much less maintenance than what a puppy is. But we love both of them, so I guess it won't matter in the long run. Glad I could stop by for my firs Monday Mingle, see you next week! Just stopping by to follow and say hello with Friday Follow. Not sure what literary character I would be. I wish I could have gotten here sooner, but I am glad I made it! GERMS!!! I am so right there with you on that one!! Cheers! I haven't seen that movie either - I will have to check it out! Yes, I can definitely see the dilemma with the pets LOL. I think the responsibility factor is also what keeps me from getting a dog. I'd love to have one, but I'm not sure if I'm up to all the work involved, especially since I want more kids (and they're a lot of work themselves).